There is nothing new about education evolving to accommodate new information mediums and platform. Despite the initial resistance from a few skeptics, philosophers in ancient Greece quickly recognized that writing was a technology that would ultimately serve rather than undermine their educational mandates. Similarly, while a few monks continued to copy books out by hand long after Johannes Gutenberg introduced the world to the printing press, most scholars were quick to embrace movable type as a medium that supports education. So today, as the world becomes increasingly mediated by digital and mobile technologies, it is no surprise that education and training continues to evolve, but are all new technologies potential supports for education and training? 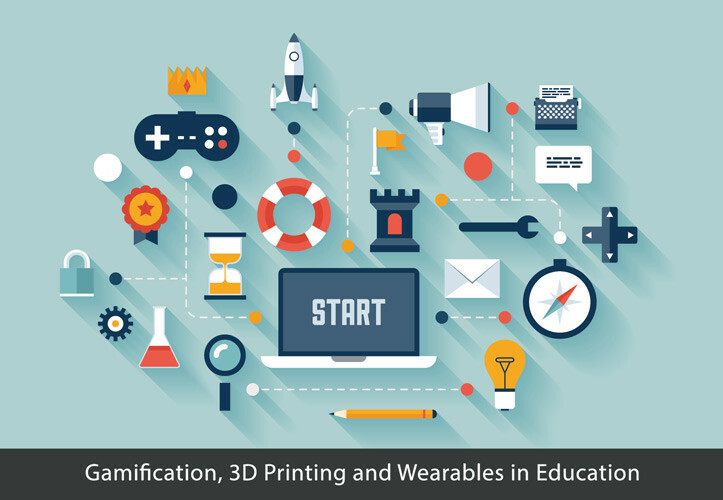 To explore this question, let’s consider the educational potential of three recent trends and innovations: gamification, 3D printing and wearable technologies. Gamification attempts to incorporate aspects of games (e.g., levels and badges) into non-game experiences, including educational and training events. In short, gamification enables students to accumulate points and other types of rewards by accepting challenges. Like the Boy Scouts or Girl Guides, gamification uses badging and ranking to acknowledge learners’ achievements. At its core, gamification aims to bring the competition of games to the world of education and training, but does it work and will it prove enduring? Supporters of gamification argue that it harnesses the motivational power of games and puts it to work in real-life situations. After all, gamers often voluntarily dedicate hours to solving problems in virtual worlds. In theory, with gamification, the same dedication is redirected to enhance the education and training of students and workers. While this may sound good, critics charge that gamification is superficial, consumerist and pivots around forced social interactions. Rather than promote lifelong learning, critics charge that gamification will produce a generation of learners who can’t learn without instant gratification. So does gamification have a future? Buy in from educators and trainers, even those invested in the serious play of games, has been slow. Indeed, despite the initial hype, in early 2015, gamification’s future appears to be more bound for commercial than educational applications. If you haven’t already noticed, copy machines are no longer just about reproducing documents. Long gone are the days when copy machines were even simply about paper. Since 2009, companies, like MakerBot Industries, have been helping people build products of all kinds with minimal technical expertise. Priced at $1500 to $3000, these replicators are accessible to a wide range of organizations and even individuals and a growing number of websites offer users source files that enable anyone to print objects without original designs. In educational and training contexts, 3D printing has a myriad of potential uses. Specifically, in the art, design and applied science programs, 3D printers are already being used to “print” or construct models that hold the potential to illustrate complex concepts, new ideas, designs and even chemical molecules. While 3D printers may never become as ubiquitous as copy machines, all signs indicate that over the coming decade, they will become increasingly common fixtures in schools and workplaces and play a growing role in education and training, especially in STEM fields. By enabling students and workers in training environments to quickly and inexpensively develop physical prototypes, 3D printers hold the potential to radically transform how science, technology, math and engineering are taught and to create increasingly collaborative and creative environments for the training of STEM professionals. Wearable technologies are not simply about putting computer applications into accessories from glasses to watches to pendants but ultimately about making computing ubiquitous. With wearable technologies on the rise, the line between humans, computers and other living and non-living things will become increasingly blurry. While wearable technologies continue to find a receptive market in the entertainment industry, moving into the future, the role of wearable technologies in the classroom will no doubt continue grow. While cynics may consider wearables, like the Keyglove, Muse or Google Glass, nothing more than passing trends that will soon be ridiculed as futuristic technologies that failed, some educators and training professionals maintain that wearable technologies hold the potential to permit learners to more naturally engage with their environments and thereby, promote creativity and innovation. With wearables, information barriers effectively collapse, opening up new opportunities for learning both in traditional classrooms and in training environments targeting lifelong learners.